I don't know if I handicapped myself or not by not re-reading the book before seeing the movie. In general, I enjoyed the movie and most of the casting. While at first I balked about the battle room, I came to appreciate it as the movie continued. The sacrifice of the Valentine and Peter side story I thought was justified, it would have been generally a distraction from the main narrative. Though, its inclusion would have probably forced a much different movie to be made and a longer one at that. I started rewatching it last month, so perhaps I'll finish that re-watch tonight and return with more observations. Was it the best movie? Naw. Entertaining, I think so. I liked the movie way more than I thought I would -- thought the script had an unusual thoughtfulness, though you'd need to be a way more brilliant filmmaker than Gavin Hood to bring across the novel's crushing, drawn-out anxiety. The film seems to take place inside of a year, which really brings up the question of just how great Ender is if he can win the war as a half-trained and unindoctrinated teen. Hood made some smart adaptational moves, like making Ender's school on earth a kind of minor-league Battle School, to extend the timeline of training without requiring him to make Boyhood. It just wasn't really enough to give events the right sense of exhaustion. Surprised by how little I liked Asa Butterfield (who I loved in Hugo, and who might just have been done in by the effort of the accent, or by the fact that they tried to transpose a story about a child onto a teenager). His great power as an actor, the ability to visibly think, was weirdly underused. Harrison Ford had his moments, though they cut Graff's qualms pretty much wholesale, which didn't leave him with much of a character (I guess the plan was to give the qualms to Anderson, but that didn't leave Viola Davis with much of a character, either). I thought the first half-hour was the best; the dynamic between the Wiggins, the obvious history between the Fleet and the family, Graff's robotic attempts to connect with Ender. Once they stepped onto Battle School, it kind of lost me. To me, the strangest decision was cutting the fact that Ender wins the war while trying to fail. I get that his breakdown wouldn't have been plausible because the whole point is that he falls apart slowly and in many stages, and the film, for a bunch of reasons, couldn't have a long timeline. But that was the emotional center of the book, that his attempt to appear too psychotic for the Fleet actually gave them exactly what they wanted, and that his attempt to reject the concept of winning ends up getting him the biggest, ugliest trophy of all. Also, it felt really too slavish an adaptation: like it had a checklist of scenes in the book that it had to translate to screen. The result is that it often felt rather telescoped: we jump immediately from Ender getting command of Dragon to their final battle, skipping all the build of Graff throwing increasingly impossible scenarios against them. Similarly the Command School battles are shortened and we see less of the toll it takes on them -- Petra breaking down in mid-battle -- instead just a throwaway line about "sleep deprivation." I think it would have worked better if they'd cut the scenes with Peter and Valentine altogether: the trimmed versions of Peter and Valentine here are paper-thin "he's a psychopath, she's a carer" characters who don't really seem particularly important in Ender's story. Asa Butterfield needs to stop flaring his nostrils. It's like he's incapable of acting unless he's doing something with his nose. I really liked the film. It was entertaining. First half: Full Metal Jacket with kids. Second half: Star Wars with kids. I was disappointed by this movie. I feel like there's probably a good director's cut lurking somewhere, or you could make one, if you were willing to just kind of ignore the age of the actors and make the movie longer both in runtime and in-universe time. It did explain one thing that bothered me about the book. I couldn't understand why anyone used "formations" at all, let alone why they were seen as absolutely necessary. But in the movie they showed people basically thrown out of the formations to propel them, like the old "balloon full of frogs" explanation for rockets. It makes sense that that's the only way to steer in zero-g. So Ender figuring out a way to not do that would actually be a big innovation and a big advantage. I had too many vivid mental images which the movie chose to depict in different ways. Yeah, I've been picturing this story in really ugly, low-tech, institutional spaces since the CRT era, so the film's generic Apple future didn't make much sense to me. This is a society whose best minds are arguing in bunkers, not designing interfaces. Similarly, too many named characters at Battle School, not enough character development. It's a case study in how not to cut down the cast of an adaptation. You don't need both Bernard and Bonzo; you don't need both Dap and Anderson; you don't even need both Petra and Bean. It's like he's incapable of acting unless he's doing something with his nose. ...That's true, and I will never unsee it. "I'll try pounding his face against a showerhead, that's a good trick!" I really agree with We had a deal, Kyle re:the checkbox of scenes. It's like a lot of film makers converting beloved books are scared to adapt them, so that's what you get. I kinda think it started with Lord of the Rings. Before that films were adaptations of books, not slavish recreations. re: formations. I don't think that's quite right Vogon Frog. I think formations existed because that was standard battle tactics. Organise your troops into formations and use them as a unit to outmanoeuvre your foe. Throughout battle school that's what they learnt and that's what they did. Ender won by instead looking at the battlefield in a more stripped down essential way. Not, what tactic is best here, but what do I want to achieve, and how do I do it. The other armies (in the book) did very little complex manoeuvring, instead moving from star to star to capture it as if they were boarding parties. Ender realised there was another way. In fact very little is shown of strategies. It's all fancy whizzy shooting. And again I think the film suffers for it. That's the problem with trying to turn a full length novel into a standard length movie. You lose too much. Mini-Series or epic length films are the way to go with books I think. Short stories make excellent films. I couldn't understand why anyone used "formations" at all, let alone why they were seen as absolutely necessary. In both of them, Ender's insight is that the rules of the Battle Room -- that when you're shot, you're frozen -- lend themselves to formations as shields. The movie simplifies the rules for winning to "one unfrozen player through the enemy's gate", so Ender's formation is all about shielding that one critical player long enough to shoot them through the gate: and actually kinda neat that Ender replays that exact tactic in the final battle. The book also portrays Ender's skill at spotting patterns better than the movie did. We see a brief flash of this when Ender asks to see Mazer's HUD view and identifies the queen's ship. But Ender's tactical view in the Command School battles is largely obscured by the whizzy Minority Report graphics. I liked the battle room scenes much more than I expected I think the film would have done well to have stayed in there more. But the key weakness of the adaption was to have Harrison Ford announce too soon that this was the hero that would save the day. Perhaps it should have shown his belief but the real strength of the book is Ender learning that he really was that good. I have not been able to get through the sequels but if it becomes a long running franchise it could be space opera to put Star Wars to shame. In the book,when Ender is introduced to Dr. Device, he asks why it has that name. It's explained to him (someone made a joke based on MD), he simply does not understand because he's led such an insulated life and is unfamiliar with an MD. It seems appalling that a child lacking such a basic piece of information (but one he really has no need for and no reason to know) is put in charge of the war, as well as the fact that adults are responsible for his lack of understanding. In the movie, one of the battle school kids says it's called Dr. Device and all of the other kids laugh. In the book,when Ender is introduced to Dr. Device, he asks why it has that name. It's explained to him (someone made a joke based on MD), he simply does not understand because he's led such an insulated life and is unfamiliar with an MD. FYI you can read that section of the book here. I had put off watching this for a long time because Orson Scott Card is such a jerk, but finally saw it yesterday in a way that will not enrich him. I ended up liking it a lot. 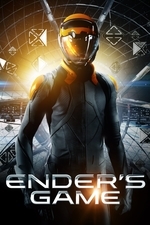 I think it would have been better with another half-hour or so to decompress the story; without the book as reference Ender's connection to the Formics isn't made strongly enough. I thought the casting and acting was great and I loved the visuals.